"These are just as good, if not better than, Buffalo chicken wings but without the mess! You can use ground turkey in place of the ground chicken. Serve on toothpicks with celery sticks, hot sauce, and blue cheese dressing." Preheat oven to 450 degrees F (230 degrees C). Coat a large rimmed baking sheet with olive oil. Heat 3/4 cup hot sauce and butter together in saucepan over low heat, whisking constantly, until butter is melted and completely incorporated. Cool to room temperature. Stir chicken, bread crumbs, hot sauce mixture, celery, and eggs together in a bowl until evenly mixed; roll into 1-inch balls and place on prepared baking sheet. Bake in the preheated oven until cooked through, about 15 minutes. An instant-read thermometer inserted into the center should read at least 165 degrees F (74 degrees C). Cool on the baking sheet for 5 minutes. 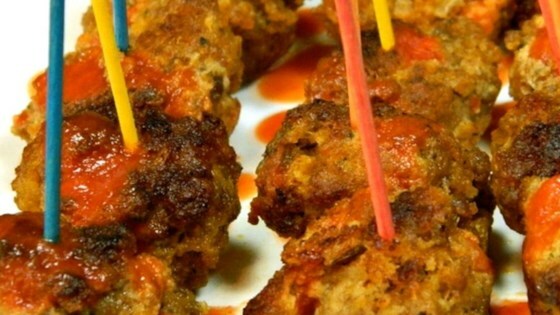 Transfer meatballs to a platter and drizzle with 2 tablespoons hot sauce. I used Frank's Buffalo sauce instead for the red hot and butter mixture. Still tasted good and saved on the calories!! I cooked them for 25 minutes per one reviewer. Made for a slightly crispy outside and sooo good! Will definitely put this in our rotation! These were a great way to scratch the itch for chicken wings, without having all the fat and calories. I used ground turkey breast and panko breadcrumbs. Thanks for the great recipe! These were awesome. Easy to make. I added some mozzarella cheese in the middle of the ball and it oozed out perfectly. You could make a day ahead and be ready for the party!